Yosemite Valley Lodge in Yosemite National Park is the ideal place to enjoy the beauty of Yosemite Falls, be close to numerous Yosemite attractions and relax after a day of adventures. Book Online. Be captivated with our small-group adventure showing off giant Sequoias, spectacular waterfalls, wildlife & gorgeous rivers. We stay and dine at this lodge during our trip. Yosemite Valley Lodge, formerly the Lodge at Yosemite Falls, was named for its close proximity to this incredible waterfall, is a great location for families to enjoy all the sights and sounds of world-famous Yosemite National Park. Let the rushing sound of the falls lull you to sleep at night. Wake up to a day of adventures! Yosemite Valley Lodge is located on Yosemite Lodge Road off of California Highway 140 (Northside Drive) in Yosemite Valley. Not only can you see Yosemite Falls from your accommodations at the lodge, but you can also get up close and personal by hiking to the Lower Falls for a view. You can even hike to the top of the falls on a trail, if you feel up to it. This is the tallest waterfall in Yosemite, and the fifth tallest in the world. From Yosemite Valley you have terrific vantage points from which to see the most famous rock formations in the park. El Capitan is called the largest monolith of granite in the world, and for good reason – it towers 3,000 feet above the valley floor. Half Dome can also be seen from a number of spots throughout the valley. A wide array of hiking trails begins in Yosemite Valley. There’s Bridalveil Fall Trail, taking you to the base of this lovely waterfall. Of course, you can also walk on an easy 1-mile trail from the lodge to Lower Yosemite Fall. From the Valley Visitor Center, take the Cook’s Meadow Loop for amazing views of Glacier Point, Royal Arches and Half Dome. There are many more trails, both easy and more strenuous. Take your pick! Touring this lovely village is a real treat. Stop by the Yosemite Park Visitor Center to learn more about this region. You can also see art galleries, including the popular Ansel Adams Gallery. Don’t miss this Indian Village where you can see how the Ahwahnee Tribe from Yosemite Valley lived. Participate in demonstrations of Native American handicrafts. Yosemite Valley Lodge is open year-round, offering a choice of 226 lodge rooms, 19 standard rooms and 4 larger family rooms. All rooms have daily maid service. Each has a balcony or patio, a private bath, dressing area and desk. A television with a DVD player and a telephone are each standard in the rooms. Some rooms have views of the Yosemite Falls. 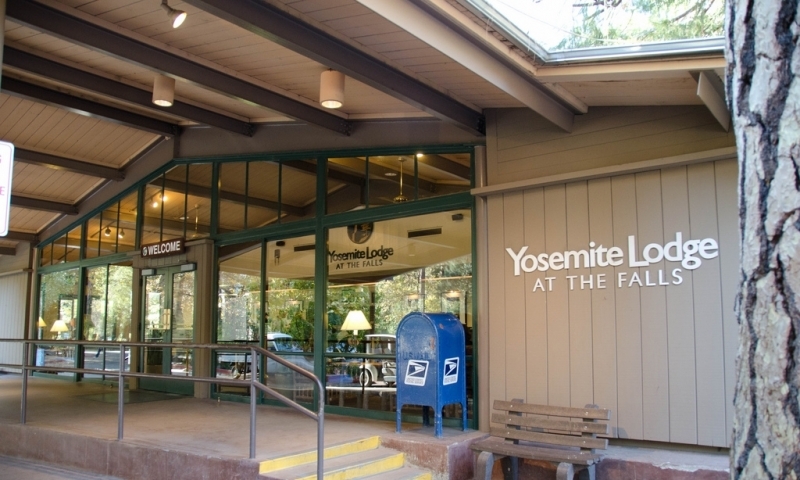 Yosemite Valley Lodge also features an ice cream stand, food court, lounge, outdoor pool and a babysitting service. You can rent a bicycle on the grounds, too. The Mountain Room Restaurant offers delicious California cuisine. Feel free to browse the Nature Shop with unique artwork, and the gift shop where you can find newspapers, magazines, gift items and more. In the center of the Lodge, you can attend the ranger and naturalist programs in an outdoor amphitheater, enjoying slide shows and movies during the summer months. 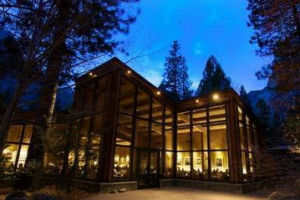 To make reservations at Yosemite Valley Lodge at the Falls, call 888-413-8869 or Book Online.